Enग lish Vingliश as the title suggests is a हिं ग lish (hinglish) movie. The cast has Sridevi as the main protagonist in a sensitive yet humorous script by Gauri Shinde. Watched the film about 2 times over a period of 3 days and have not found it least bit boring. The first time though, I missed the first 20-30 mins of introduction. There is also a scene -"When Sridevi enters USA and is talking to the immigration", where Marianne Soares (one of our family friends) appears in the scene if you observe carefully. Yet Another southie fan ! 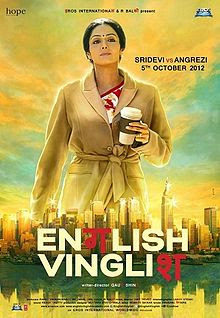 Credits : Movie poster for English Vinglish taken from wikipedia.